Bihar Board Chairman, Anand Kishore, spoke about the confusion that arose as students, who filled up forms in both 2017 and 2018, were allotted marks from best of 2. Patna: The Bihar School Examination Board (BSEB) on Monday dismissed allegations made by students of discrepancies in the marks awarded. He assured that not a single such case will come out wherein students were given more than the maximum marks. "List of students was made. I can assure you there's not a single such case. Confusion arose as those, who filled up form in both 2017 and 2018 were allotted marks from the 'best of 2'. 50-50 marks for theory and practical," Mr Kishore said at a press conference here. Mr Kishore stated that students, who still feel that there is discrepancy in the marks allotted, can apply online for correction. "If a student still feels there is discrepancy in the marks allotted, they can apply for it online from May 11-19," he said. 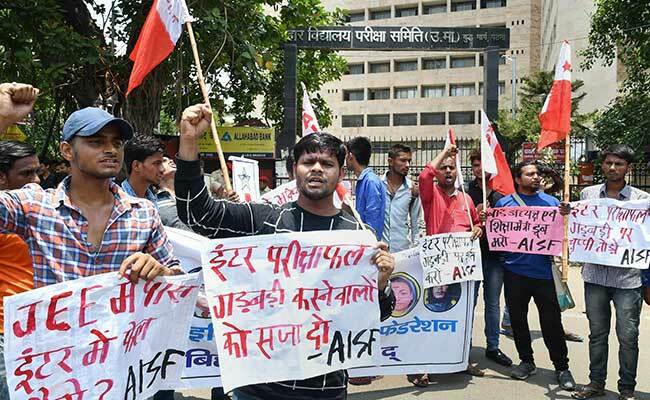 Last week, students were lathi-charged while protesting against the alleged discrepancy in checking of their answer sheets outside the board office after the results were declared last month. The intermediate students claimed that they have been given one or two marks out of 100 in Physics and Chemistry even when they have cleared IIT-JEE (Mains) examination. While many claimed that they have got marks much below their expectations, there are those also who said they have been given marks in excess of the maximum marks. "I was given 68 on 50 marks in English theory and 38 marks on 35 in Physics theory," one of the students said. The students are now demanding that their answer sheets be rechecked or the board again conducts the exams. Over eight lakh of 12 lakh students, who had appeared for the Class XII exams conducted by the BSEB, have failed this year, leading to anger and distress among students.